What Are a SJ4000 and a GoPro? Is There a Need for SJ4000 or GoPro? GoPro is, by far, the durable, waterproof, sports action-cam marquee brand. 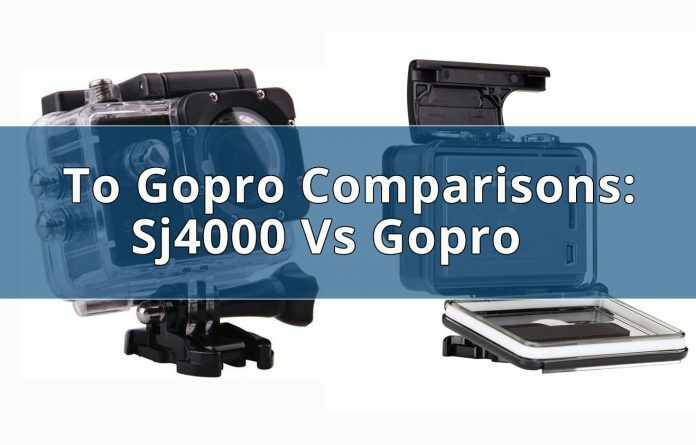 However, a head-to-head comparison of the “budget” competition’s SJ4000 vs GoPro’s budget-friendly “Hero” model shows that the “budget” brand is (almost) giving GoPro run for its money. Any brand that achieves enduring marquee-level recognition (and consumers willing to pay a premium for it) will inspire competition to position “budget” alternatives. GoPro defined the tiny, mountable, rugged, waterproof action camera market. 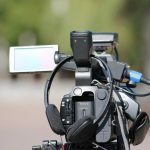 Its cameras spawned action-oriented YouTube channels devoted to everything from surfing, to para-gliding, car racing, and even airline pilots in action. Their cameras have even been adopted by the professionals, surviving major falls and explosions in Mythbusters and even being strapped to players during National Hockey League games. Despite the fact that everyone is now carrying advanced iPhone and Android cameras, GoPro maintains a massive following. Though intensely single-purpose, their cameras are small and rugged enough to survive in places and situations no one would dare risk a phone, including being mounted to surfboards, helmets, motorcycle handlebars, and even airplane wings.However, with GoPro’s cameras retailing for north of $300 (and flagship models commanding $600+), many would-be auteurs are priced out of the market. 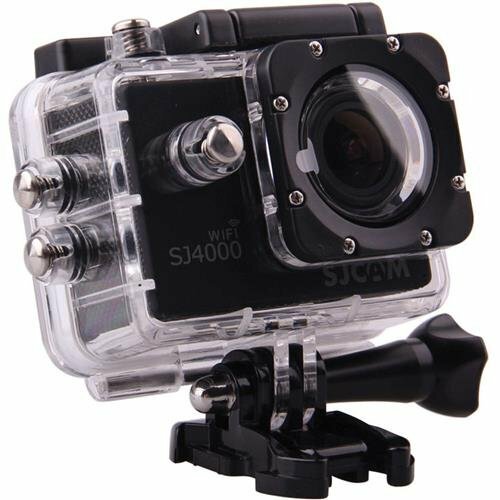 The SJ4000 represents what could be called a budget GoPro “clone”. 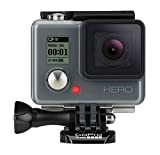 It has the major features GoPro offers: it is compact, waterproof, rugged, and mountable to a whole host of accessories. It takes comparable-quality video in the same formats. Looks-wise, it could even be mistaken for a GoPro, particularly to the non-discerning eye. What that non-discerning eye would appreciate even more: the price. In fact, in an ironic turn the SJ4000 vs GoPro price difference meant people who bought GoPros to spare damage to their smartphones have since bought SJ4000s for filming situations where they might damage their GoPro. The low-price competition changed the market and inspired GoPro to introduce its own entry-level model, branded the GoPro “Hero”. Though the Hero receives some criticism for being previous years’ GoPro cameras technology dressed up as though it were new, it provides more direct competition and (most importantly) comparable GoPro vs SJ4000-level pricing. Short answer is "yes." The long answer requires a feature-by-feature comparison of the two cameras. In many respects, the two cameras are the same, with some minor (but important) differences that consumers should consider before deciding. Both cameras are virtually the same size, to the point that they are interchangeable for all but the most sensitive uses. The SJ4000 vs. GoPro Hero build quality is very close, with the GoPro having a slightly higher quality. However, this quality is negated when you consider each brand’s approach to protecting the camera from moisture via a waterproof housing. Both cameras come equipped with a waterproof housing, with one major difference. The GoPro Hero is permanently mounted in its waterproof housing but comes with two different functional “doors” which change out almost like Lego pieces. The first door makes the camera fully waterproof but muffles the built-in microphone and blocks access to the USB charger port. The second door allows sound to reach the microphone and charger cords to plug into the USB charger port. Unfortunately, the second door is not waterproof. 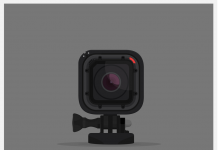 Additionally, the GoPro Hero’s being permanently mounted in its “waterproof” housing means that any damage to the housing’s lens or the surprisingly-fragile mounting brackets also permanently affects the camera’s usefulness. This is a critical difference in the SJ4000 vs GoPro comparison. 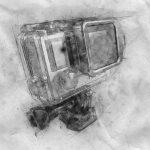 The SJ4000 can be removed from its waterproof housing, allowing the housing to be replaced and/or the camera itself to be used independent of the housing. Additionally, damage to the waterproof housing is not damage to the camera (or lens or mounting brackets). The SJ400 is clearly more flexible in this capacity. The GoPro is rated waterproof to a depth of 130ft while the SJ4000 is rated to 100ft. It may be relevant here that the maximum depth recreational scuba divers can dive to is 100ft. One of the major differences between the two cameras is that the SJ4000 has a built-in 2-inch square color LCD viewfinder screen that allows you to see what you are aiming at. The GoPro Hero has no screen or viewfinder. You have to guess. Though this seems a major oversight, there are many situations where a viewfinder is not important. If you are mounting the camera to a helmet, chest-strap, bicycle handlebar, or even an airplane wing, aiming in the general direction you want recorded is fine. The screen is not necessary. However, if getting your shot framed just right is important, the SJ4000’s LCD screen is the clear winner. Considering battery life requires dissecting exactly how you will use each camera. Our testing indicated the GoPro has nearly twice the battery life (2.5 hours of continuous 1080p recording) as the SJ4000 (1.4 hours). If you are going strictly on battery life, the GoPro wins. However, the SJ4000’s battery is replaceable, which allows you to swap out batteries (assuming you have multiples already charged) and continue filming. With the GoPro, you’d either have to recharge or have a backup (charged) camera. Caveat to the SJ4000 vs. GoPro battery comparison: the GoPro has a built-in, accessible USB charger port, which allows you to plug the camera directly into a charger and film continuously. But that also means you are tethered to an outlet, extension cord, or external battery pack. Technically, the GoPro has image stabilization and the SJ4000 does not. However, because both cameras have a relatively wide-angled field of view in all settings, the difference is negligible. When mounted to the same vibrating surface, the images from the SJ4000 vs. GoPro cameras are virtually identical to all but the most discerning viewer. However, if a stable image is absolutely critical, the GoPro has a slight edge here. When aimed at the same scene, both cameras capture virtually the same “wide-angle” (roughly 170 degree) view. The GoPro has a “Super View” setting that expands this field slightly, but the image becomes distorted. It is almost like a slight “fisheye” lens was used, adding a bit more image to the top and bottom of the frame. On that same note, the wide-angle nature of both cameras means that even close objects seem distant and images moving along straight lines (think moving down a street along buildings and sidewalks) will have a slightly bowed effect along the edges. This bowing is common in small sports-oriented cameras of this type and accepted by viewers. Television shows and movies use the effect to simulate “amateur” footage and fast-moving action. This wide-angle tradeoff is inherent to both cameras, leaving the SJ4000 vs GoPro field of view competition a slightly bowed wash. The difference between each camera’s image quality becomes evident when considering exposure. The GoPro has a clear advantage when the cameras encounter an environment with mixed lighting, such as a dark foreground and a bright background. Think in terms of a row of trees against a bright sky, or a roadway flanked by darker buildings leading to a brightly lit intersection. The GoPro found enough of a balance between the contrasting dark and light to allow both to be visible. The SJ4000 focuses on the bright parts of the image, leaving the darker parts silhouetted or totally black. The GoPro is the clear winner in this regard. Though the GoPro handles high light/dark contrast more gracefully than the SJ4000, it does so at the expense of image sharpness. When both cameras took footage of the same static scene on the same 1080P settings, edges and text were more clearly defined in the SJ4000’s images, particularly when zoomed in to the point that you could read small-lettered signage. However, when both cameras were mounted on the same stationary surface, then aimed at a moving vehicle, still frames grabbed from each camera’s footage were nearly identical. As with light/dark contrast, the ability to adjust color settings on the SJ4000 vs GoPro are non-existent at this price level. Footage and images taken with the SJ4000 are bluer in hue (and therefore, “colder” in photo parlance). The GoPro footage leans yellower (“warmer”). This is true at 1080P and 720P settings, but not as prominent in still images taken with the cameras. In addition to HD 1080P and 720P video, both cameras can take individual still images and burst images (rapid-fire sequences of still images for capturing action shots). There is a sharp contrast between the SJ4000 vs GoPro when it comes to file size. With each camera taking 30 minutes of 1080P footage of the same scene, the SJ4000 produces a 4.5 gigabyte file, while the GoPro produces 10 gigabytes. Though this seems like it would be a hands-down win for the SJ4000 (smaller files means less of the camera’s max 35 gig storage memory gets used up), this is a major limitation for those who want to do more than simple editing. Of course, the SJ4000’s smaller file size means faster uploading of the footage and less processing power is required for the limited editing available. The trade-off consideration is to ask yourself how much post-processing you plan to do with your footage. Are you going to the editing bay or straight to YouTube? In a side-by-side SJ4000 vs GoPro comparison, neither camera produces studio-quality sound. Neither camera has the ability to plug in an external microphone. Even though GoPro sells an adapter that plugs a microphone into the charger ports on some cameras, it does not work on the Hero model. Of the sound recording available, GoPro has a warmer sound capture. The SJ4000’s capture is quite tinny. And both cameras capture all the ambient sound around them. You hear the wind, cars, and everything else that makes this kind of recording seem amateur. There is one minor caveat on the GoPro. Recording sound requires installing the non-waterproof door on its waterproof housing. If you go with the waterproof door, it muffles the sound. Both cameras come with a standard tripod mount. GoPro’s long-term popularity has spawned an entire ecosystem of accessories that allows its cameras to be mounted for a host of uses. There are tripods of all sizes and uses, selfie-sticks, stabilization gimbals, chest straps, helmet mounts, tube mounts (for handlebars and anything else tubular), and suction mounts for glass and other smooth surfaces. Some of these can also be used for the SJ4000, but GoPro’s proprietary camera attachment points means that many cannot. At the same time, GoPro’s accessories also command premium prices, just like the camera, so that might not be a plus for those who are seeking budget options anyway. One feature the SJ4000 offers (as an option) that the GoPro Hero does not is WiFi. This allows the user to view the live image from the camera using an iPhone or Android phone, as well as allowing cable-free footage uploading to a PC or Mac. Though there is discussion about whether the SJ4000 vs GoPro can be used as an automobile dashcam, both cameras lack key dashcam features, such as instant-on when an external power sources is turned on (i.e. when you start your car) and record-over mode (where the recording process records over old footage once the camera’s memory is full). Neither is ideal used as a dashcam. One consideration users should give when evaluating these cameras is how they are going to use it. 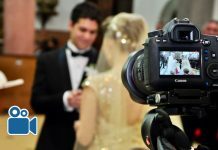 If you are intending to do more intensive post-production editing or are even considering using the camera in professional broadcast or film work, the GoPro more likely fits your needs. But it will also require more effort to learn to use at that level. 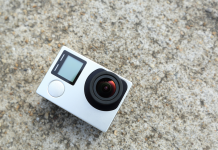 GoPro also makes editing software for use with their cameras and the additional data contained in the footage recorded by a GoPro means it will be more useable in higher-end editing and post-production packages, such as Apple's Final Cut Pro. If you are looking more for a quick, waterproof camera to toss in your bag for a weekend surfing or para-gliding trip, the SJ4000 is likely more your style. You still get great, editable footage suitable for YouTube uploading. Learning to use the SJ4000 vs GoPro Hero cameras requires similar technical know-how. Both cameras are fairly easy to use straight out of the box, with more advanced features requiring more effort to understand. Each camera comes with a brief “getting started” instruction manuals. Savvy users will find numerous online forums and user groups to help advance their knowledge and answer questions. Of course, GoPro’s market longevity and wider user base means more resource of this sort. Physically, the relatively small size of each camera means that the controls and indicators are equally small, which may be a challenge for users with larger fingers and/or difficulty reading small print. Think in terms of trying to set a digital watch. The tiny buttons and tiny screen may obscure features, requiring lots of experimentation and/or manual-reading to access. The SJ4000’s LCD screen is an ease-of-use advantage in this area, as many of the settings are displayed on here vs the GoPro’s tiny black-and-white screen. Despite minor differences, the SJ4000 vs GoPro are both capable, rugged, waterproof and budget-conscious sport cameras. The biggest difference between the two comes down to price. 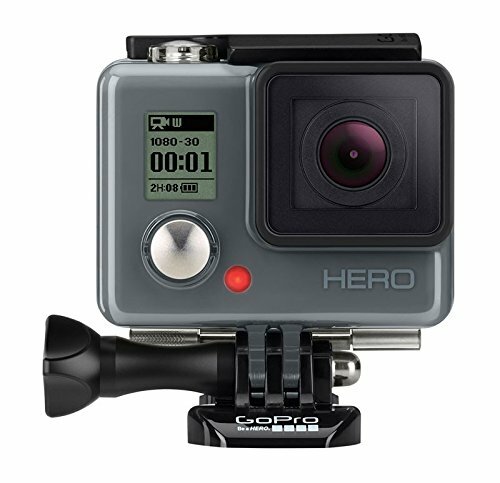 Though GoPro Hero created the Hero model to compete with budget clones like the SJ4000, the GoPro tends to be priced at nearly twice the cost of the SJ4000. One consideration worth asking is how much risk you are planning to take with this camera. Are you placing it in a situation where it could get dropped, burned, or lost? A camera mounted on your dashboard to record that glorious coastal drive is limited risk; suctioned to your surfboard or wing is a bit less limited. In the end, it's up to you! Next articleGarmin Virb vs GoPro: A Product Comparison – Which is Better? Gopro vs Sony Comparisons – Which is Better in the World of Cameras?